Lusaka, 30th June, 2009. The Ministry of Finance and National Planning reiterates the announcement made by his Honour the Vice President that a bill will be presented at the next sitting of Parliament to provide for the presentation of the National Budget in the last three months preceding the commencement of the Government Financial year in January. In this regard, the 2010 National Budget is scheduled for presentation before the end of the year, subject to approval of the proposed amendment by Parliament. Contact details in form of postal address, telephone and email. Through this consultative platform, the Ministry of Finance and National Planning is keen to ensure that objective and informed policy choices are included in the 2010 National Budget. In this regard, all citizens, state organizations, local businesses, non-state organizations, and both local and foreign investors are encouraged to exhaust consultations among their peers so that the submissions have the full support of stakeholders in the design of Zambia’s development affairs through the budget preparation process. The Deadline is Friday 17th JULY 2009. Once again I take this opportunity to reiterate our appeal that all submissions must clearly state the nature of the proposal, demonstrate pitfalls of the current tax regime and indicate pros and cons of the offshoot measures. All proposals will be objectively scrutinized and assessed based on their merit and impact on tax payers, the economy, and the significance of the contribution to shaping and focusing of the Zambian tax policy orientation for the period 2010 to 2012. It is imperative that all Zambians, including the media, respond to this call for tax and non-tax policy review input. Source: Kaufmann, Kraay, and Mastruzzi (2008). In recent years, economists have taken advantage of cross-country survey-based measures of corruption to analyse the impact of corruption on a variety of economic and social indicators. Corruption has been shown to reduce economic growth (Mauro, 1995), distort governmental expenditures (Mauro, 1998), retard foreign investment (Wei, 2000) and reduce the effectiveness of foreign aid (PSRA 2003). These debilitating effects of corruption, contrast sharply with earlier notions advanced by Leff (1964) and Huntington (1968) that corruption can be efficiency-enhancing because it removes government-imposed rigidities that impede investment and interfere with other economic decisions favourable to growth. This view is succinctly captured in the notion that corruption “greases the wheels of trade.” As Huntington states “In terms of economic growth, the only thing worse than a society with a rigid, overcentralised, dishonest bureaucracy is one with a rigid, overcentralised, honest bureaucracy.” The crux of the argument is that, in a country rife with onerous regulations, the opportunity to offer bribes allows firms to evade formal regulatory barriers. Similar to deregulation, this can be welfare-improving. In recent years, the impact of corruption in customs has come to the forefront of trade policy debate. The WTO strongly believes that agreements on trade facilitation will provide a significant boost to world trade. Trade facilitation discussions have been undertaken in the Doha Round in an effort to promote transparency, reduce red tape, and diminish the scope for corruption in customs. So is the WTO right in believing that reducing corruption in customs has the potential to enhance trade flows between counties? The reason why this question is interesting is that despite various rounds of trade talks, many countries exhibit high levels of tariff and non-tariff barriers on goods coming through customs. Therefore, the impact of corruption in customs on trade flows may be conditional on the extent of regulatory barriers that prevail in a particular country. Our work argues that while corruption impedes trade in an environment of low tariffs, it may actually be trade-enhancing when nominal tariffs are high. We define two types of corrupt behaviour. On one hand, corrupt customs officials request bribes to do what they are supposed to do, which is to clear goods through customs; on the other, they may be bribed to do what they are not supposed to do, allowing firms to avoid formal trade barriers such as import tariffs and quotas. Following Bardhan (2006), we call the former extortion and the latter evasion. In reality, country case studies have documented that corruption in customs facilitates both extortion and evasion. Parayno (1999) describes both forms of corrupt behaviour in the Philippines, where businesses became accustomed to giving small bribes for customs services and it was necessary to pay to "facilitate" even fully legitimate transactions. At the same time, misdeclaration, misclassification, and undervaluation in formal entry declaration processing were common ways by which firms could circumvent official trade barriers, in cooperation with corrupt custom officials. Arduz (2000) describes a system in Bolivia, where most goods go through a system of "parallel customs", in which customs officers levied their own taxes rather than the official trade taxes. Fisman and Wei (2004) find strong evidence for evasion through mislabelling and misclassification of imports in the context of trade between Hong Kong and China. Mishra, Subramanian, and Topalova (2008) find similar evidence for India. Our research starts by extending the gravity model of international trade which predicts bilateral trade flows as a function of distance between pairs of countries and size of each of the countries. The gravity model is the analogue in international trade to the Newtonian gravity model, which states that the force of gravity between any two particles (volume of trade between two countries) is proportional to the square of the masses (GDP) and inversely proportional to the square of distance between them (distance between the two countries). Microfoundations for the gravity model were provided in a seminal paper by Anderson (1979). This model has enjoyed empirical success in its ability to explain a relatively large fraction of variation in the observed volume of bilateral trade. We derive an augmented version of the gravity model where we show that bilateral trade depends on tariff barriers, corruption in customs in the importing country, and the interaction of the two. In our model, corrupt customs officials extract bribes from exporters. This acts as a tax and impedes trade (the extortion effect). However, corrupt customs officials may also allow for evasion of formal tariff barriers. So we have a second effect (the evasion effect), where corruption by facilitating evasion, augments the rents to be shared by exporters and customs officials. This effect encourages trade. The evasion effect can potentially dominate when formal tariff barriers are very high. We predict that trade depends negatively on corruption in customs when tariff barriers are low (the extortion effect dominates) and positively on corruption (the evasion effect dominates) when tariff barriers are high. We use comprehensive data from the IMF’s Direction of Trade Statistics to evaluate our theoretical predictions. Our dataset covers 128 exporters and 126 importers over the time period 1982-2000. These countries account for nearly 95% of world trade. We examine both overall aggregate trade between pairs of countries and trade flows disaggregated by sectors. Empirically, we provide strong evidence that the extortion and evasion effects co-exist – when formal trade barriers are low, the extortion effect dominates but when trade barrier are sufficiently high, the evasion effect dominates. Corruption does tax and impede trade in the majority of cases. However, in high tariff environments where tariffs are in excess of 25-30%, corruption can actually enhance trade flows between countries by allowing firms to evade these tariff barriers. We believe our research is valuable to academics and policymakers alike, for a number of reasons. First, we derive a corruption-augmented gravity equation for bilateral trade, where the impact of corruption on trade flows is explicitly captured. Second we highlight the inter-relationship between the effect of corruption and the extent of tariff barriers, consolidating the various strands of the intellectual history on the (positive and negative) effects of corruption. Third, for policymakers, our results have implications for trade reforms around the world. The WTO strongly believes that agreements on trade facilitation will provide a significant boost to world trade. In this context, our results provide some support to that effort, showing that reducing the scope for corruption does, in the majority of cases, reduce the impediments to trade. However, the results also show that countries that are highly protected, the right policy is to reduce the level of tariffs, and that efforts to reduce corruption might have a detrimental effect on trade volumes. Currently, only 5-14% of all bilateral trade between countries is subject to tariffs in excess of 25-30%. However, prior to the Uruguay Round tariff cuts, this number was far higher. More importantly, given the current impasse in the Doha Round of trade talks and the risk of crisis-induced protectionism, this number may easily rise in the near future. Anderson, J. E. (1979). "A Theoretical foundation for the gravity equation," American Economic Review, 69, 106-116. Arduz, M. (2000). "Descripcion y Evaluacion de las Iniciativas Tomadas contra la Corrupcion en el Servicio Nacional de Aduanas en Bolivia". Unpublished case study, OECD Development Centre/UNDP. Bardhan, P. (2006). "The Economist's Approach to the Problem of Corruption", World Development, 34 (2), 341-348. Dutt, P and Traca, D (2009) “Corruption and Bilateral Trade Flows: Extortion or Evasion?” forthcoming, Review of Economics and Statistics. Fisman, R. and Wei, S. (2004). "Tax Rates and Tax Evasion: Evidence from "Missing Imports" in China". Journal of Political Economy, 112(2), 471-496. Huntington, S. P. (1968). Political order in changing societies. New Haven: Yale U. Press. Kaufmann, D., Kraay, A., and Mastruzzi, M. (2008). “Governance Matters VII: Governance Indicators for 1996-2007” World Bank Policy Research Working Paper 4654. Leff, N. H. (1964). "Economic Development through Bureaucratic Corruption," The American Behavioral Scientist, 8(2), 8--14. Mauro, P. (1998). "Corruption and the Composition of Government Expenditure". Journal of Public Economics, 69,263-279. Mauro, P. (1995). "Corruption and growth" Quarterly Journal of Economics, 110, 681-712. Parayno, G. (1999). "Reforming the Philippines Customs Service through Electronic Governance". In Combating Corruption in Asian and Pacific Economies. Manila: Asian Development Bank and Organization for European Cooperation and Development. Princeton Survey Research Associates (PSRA) (2003). The Global Poll: Multinational Survey of Opinion Leaders 2002. Wei, S. (2000). "How taxing is corruption on international investors?" The Review of Economics and Statistics, 82, 1-11. "I believe that there were irregularities in the transaction and if it is proved that the price of the hearses was not inflated and that the terms of conditions were adhered to, I will resign as minister on principle"
The Local Government Minister Benny Tetamashimba has reported his predecessor Sylvia Masebo to the Anti-Corruption Commission (ACC) and the auditor general concerning the purchase of hearses from China. The hearses are alleged to have been purchased at a staggering price of US $29,000 per hearse. It is often difficult to distinguish calculated corruption from mismanagement. This may well turn out to be the case of the latter, but we must applaud Minister Tetamashimba's approach to this issue, where other Ministers have swept these matters under the carpet (although credit must also go to the Zambian people who are finally waking up and saying "not in my name"). It's obvious that as Minister he has looked into these documents and has concluded the law must take course. Perhaps there's some glimmer of hope that the era of national irresponsibility has started to crumble. So let us all make the collapse definite by seeing that all corrupt perpetrators are also seen to be punished. We need a new judicial process for convicting corrupt criminals, that is swift and definite (I have previously suggested "special corruption courts"). No point of having long prison sentences and good detection, if you cannot actually convict people efficiently and at minimal cost to the tax payer. In fact I would say that a corruption fight without an efficient court system has little deterrent effect on corruption. Ms Masebo responded yesterday to the allegations, formally implicating Minister Tetamashimba in the hearses deal. It remains to be seen how much of this politics, mismanagement or genuine corruption. The important issue is that the matter is now in the hands of law enforcement officers. Zambia's independent radio stations have now arrived on the internet - QFM Radio new website is nice and visual. Its only lacking RSS, but am sure that is coming! A new home with new features for the Zambia Watchdog. You can still access it via the old site but it will redirect. Nowhere in Zambia is the impact of the global financial crisis being felt harder than in the copper and cobalt-rich province of the Copperbelt. The province has for a long-time been the goose that lays the golden egg for the country. When Zambia’s economy grows, it is because mining is booming on the Copperbelt. Copper accounts for 80 percent of Zambia's foreign exchange earnings and has since 2003 been the main driver of an annual economic growth rate of five percent. At the peak of production in the 1980s, Zambia, Africa's largest copper producer, used to produce about 750,000 metric tonnes of finished copper annually. Output dropped to 200,000 metric tonnes in the 1990s. When the copper price enjoyed a renaissance at the beginning of this decade, the mines again became the major employers as production rose to more than 600,000 metric tonnes with government projecting one million metric tonnes by 2010. But because of the global crisis, this projection is seen as highly unlikely. Steep fall in demand and prices for copper on the London Metal Exchange led to government collecting revenue of just 64 million dollars from copper in 2008, rather than the targeted $415 million. In 2007, government introduced a windfall tax to ensure that the nation received a fair return from its resources, while maintaining a globally competitive mining industry. The tax was designed to match rises in the price of copper: it was set at 25 percent while copper sold for $2.50 per pound, 50 percent for the next 50 cents and increased to 75 percent when copper fetched above $3.50 per pound. The government has now removed the windfall tax in order to salvage the mining sector. Copper prices have fallen from record highs of nearly $9,000 per metric tonne between 2005 and 2007 to about $3,000 per metric tonne, leading to thousands of retrenchments. Further, the minister of finance, Situmbeko Musokotwane, has proposed to reduce customs duty on important inputs for the industry, dropping the duty on heavy oil from 30 to 15 percent and entirely removing duty on copper powder, copper flakes and copper blisters. He has also proposed to include copper and cobalt concentrates on the import deferment scheme for Value Added Tax (VAT) purpose - all to reduce the operating costs of mining companies. But the Trade Justice Network, which promotes socially just, democratic and progressive taxation systems in Africa, believes that despite mining companies closing and laying off workers, the government should not have reversed its tax regime. "Given that mines do not pay windfall tax when prices are low, this proposed tax break will mean Zambians will again fail to benefit when the copper prices rise. The result means that Zambia will continue to wait for many years before mining companies contribute to the budget," Alvin Mosioma, co-ordinator for Trade Justice Network Africa says. Instead, Mosioma is calling for the government end the practice of granting tax exemptions to mining companies when signing contracts, and for bilateral and multilateral donors to scale up their financial assistance to Africa governments to improve their capacity to monitor and audit the accounts of mining companies. The country’s mining companies have either reduced production or put the mines on care and maintenance, citing the global economic slump, which has seen international copper prices tumble from record highs of nearly $9,000 per metric tonne between 2005 and 2007 to about $3,000 per metric tonne. Luanshya Copper Mines (LCM), a joint venture of the Swiss-based International Mineral Resources and Bein Stein Group Resources of Israel, closed its operations in December 2008, resulting in 1,700 retrenchments. Mopani Copper Mines (MCM) also recently retrenched up to 1,000 workers while the country's biggest mine, Konkola Copper Mines (KCM), owned by the London-listed Vedanta Resources, laid off 700 after shutting down its smelting plant. MCM chief executive officer Emmanuel Mutati says his firm was ill-prepared to face the global economic downturn. "Last year - and in particular the last six months - proved to be very difficult and challenging. The remedy for re-positioning ourselves has not been easy for us to take. Regrettably, some of our workmates lost their jobs and a number of contractors lost sizeable investments as we tried to reposition the company in order to meet the challenges." Opening Parliament in January this year, President Rupiah Banda warned the mining companies not to use the global financial crisis as an excuse to lay off workers, especially now as government had made amendments to the Mines and Minerals Act to encourage foreign direct investment in the mining sector. On the Copperbelt, many retrenched miners have resorted to informal trading to make ends meet. Jack Mwanza is among those that were laid off and received $7,200 as terminal benefits. The money however proved not to be enough as he was required to service a loan that he got from a local micro-finance lending institution. "They deducted 10 million kwacha (around $2,000) from my terminal benefits. The remaining amount was used to pay school fees for my school-going children, buying food and to start a small katemba (grocery) which my wife and daughter are running, but the returns are really minimal, we’re only praying that the new owners get us back to work because clearly, we wont survive for long like this," says Mwanza, a father of five. Marjorie Mbewe, a mother of six whose husband was among those retrenched at Luanshya Mine, has been forced to open a makeshift stand outside her house where she is selling mostly vegetables. "It's become very difficult to survive now. The money my husband received wasn’t enough because he had a loan to pay. We used to have at least three meals a day, but that’s not possible anymore. If we manage two, it’s a real bonus," Mbewe says. Luanshya district administrator, George Kapu, says life has been difficult for most residents since the mine stopped production and retrenched the majority of its workers, leaving only a skeleton crew to prevent the closed mine from flooding. "Yes, a number of them have lost their jobs. It’s been hard for them to make ends meet," he says. The closure of the mines and other companies has also limited the capacity of local authorities to effectively provide public services. "Municipal councils throughout the province are finding it very difficult to operate as most of them depend on these companies for survival through rates and other taxes," says Mwansa Mbulakulima, the Copperbelt provincial minister. "As a result of this, council’s are also finding it difficult to pay salaries to its workers." Copperbelt Energy Corporation (CEC), which supplies power to the mines on the Copperbelt, also says the closure of mines such as Luanshya and Chambishi Metals will lead to a 15 percent reduction in its turnover. "We expect this year to be very difficult than last year," Michael Tarney, the company’s executive director says. But for the most residents on the Copperbelt, life without copper mining is definitely not an option at this particular time, having previously seen how quickly their cities turned into ghosts when Anglo-American Coorporation pulled-out almost a decade ago. And for a region that has solely depended on copper mining for several decades, diversifying its economy will not be easy. World leaders gather at the United Nations in New York this week, to consider short- and long-term responses to soften the impact of the global economic downturn on people like Marjorie Mbewe and Jack Mwanza. They are also expected to discuss changes to the international financial system to better serve the needs of all U.N. member states. The Pf Chairman for Information Hon Given Lubinda (MP) appeared on the Brain Drain Blog Talk Radio. A very good show by James Mwape who kept the dialogue focused and gave the Honourable time to explain things. It certainly clarified a few things e.g. the UPND/Pf pact, the economic vision, the Pf view of the diaspora, etc. Well worth the listen. This IRIN news item from Malawi on the burdens facing girl children provides a good opportunity to revisit an important blog written from the early phase of the Zambian Economist - more than a woman.. The Growth Commission makes similar points on the importance of girl child education. The annual rate of inflation, as measured by the all items Consumer Price Index (CPI), reduced by 0.3 percentage points from 14.7 percent in May 2009 to 14.4 percent in June 2009. The decrease in the annual inflation rate in June 2009 was mainly attributed to reduction in the prices of some food products such as mealie meal and maize grain. Angola and Russia have signed a contract for the building, launching and operating an Angolan telecom satellite AngoSat worth $327m . The production of Angosat will take 39 months to finish and the Russian government will provide Angola all necessary technical means, training of Angolans in space technology for satellite management. The satellite has a designed lifespan of 15 years, and will serve to support Angola's national infrastructures of telecommunications and terrestrial digital television all over the country. It will also enable the coverage in Africa, Europe, in C band, and Southern Africa region in particular, in Ku band. More via UK Guardian and Xinhuanet. It appears that High Court Musonda is arrogantly over exercising the fact that – in matters of law, the Tribunal is technically subordinate to the criminal or High Court code – if I understand these things correctly. If so, it is that ammunition he perhaps relied on when passing that judgment in favor of Dora Siliya and RB’s government. Conversely, it wouldn’t surprise anyone if RB delay in sacking Siliya was based on the pre-knowledge that they would take advantage of this loophole. When you consider these points – plus many other relevant ones not outlined here, you end up concluding that – the Zambian people have no body else to redress their grievances. What an awful position to be in? No wonder many young Zambians are mad. How can they not be outraged? It is no wonder many of them desire to leave the country. When shall we get another Jesus-like savior? It would seem hypocritical to laud a judicial process only when the outcomes are punitive to the defendant. Surely Judge Musonda's ruling was not beyond the comprehension of Dora Siliya's protagonists. If Dora Siliya was not in breach of the Ministerial Code of Conduct, surely she now qualifies for consideration and reappointment to Ministerial office? I suspect it would be a dangerous double standard to refuse to recognise her innocence in the matter simply because she once stood accused. Why then would this seemingly logical sequence of events raise the ire of many. One word - timing! The combination of a mis-timed appointment - shortly following the ruling - and the unforgiving court of public opinion where Dora Siliya, it appears, remains guilty, and possibly perceived to be incompetent, means this has been a political faux pas by President Banda! Spend all the money meant for luxury clinics in South Africa in our institutions. No one developed South Africa apart from South Africans. I would call my dad a fool to go and bath in our neighbour's bathroom because he can't fix ours. Make sure you setup a policy to make it only as a matter of impossibility to be handled in our country for any minister to go to other countries for treatment. That way, you would ensure all things good and resources are spent on our workers. Kaunda was treated in UTH and if that fails, Maina Soko. Thats a leader - no monkey would fail to respect that. Lead the people in looking and believing 'Made in Zambia' is the best. How I wish I could be given a chance to let people know that they shouldn't look elsewhere but home. You have the chance, but you want to be bigger than the Post! Computer World are reporting that the Government is moving forward to block the importation of old computers on environmental and health grounds. According to Communication and Transport Deputy Minister Mubika Mubika, "Zambia is not a technological dumping ground for outdated ICT equipment". Among the surprise backers of this move is the Computer Society of Zambia who have blamed foreign non-governmental organizations (NGOs) for the influx of outdated computers in Zambia: "We should be able to have specifications at all entry points so that all the computers that do not meet such specifications are not allowed entry into Zambia". It goes without saying that beneficiaries of donated computers do not entirely agree. In the words of School Head Teacher Amos Makanya, "the Zambian government is well aware that most schools in Zambia cannot afford to buy new computers for use in schools. If the Zambian government is serious about promoting the use of computers in schools as they have been claiming, then they should not block imports of old computers". Step 1 requires clearly defining the nature and scale of the problem (health / environmental pollution). Step 2 is then to assess whether the benefits from these computers to poor children in rural areas outweigh the social costs. This must take into account the distributional issues. It is the poorest in society that have no computers. Step 3 asks if these costs appear higher than the benefits, then what is the best mechanism for addressing this? I suspect banning outrightly, will not be the answer. The issue of "procedural fairness" also comes into it. We want to use instruments that are not only efficient but also procedurally fair to all parties concerned. The post In defense of the Kachasu industry is an example where this framework is applied in helping us think about complex issues where the optimal social outcome is less clear. An important development mid week that appeared to have got little traction in the Press. Godwin Beene, the Mining PS disclosed to Reuters that the bids for oil exploration have opened with a closing date of August 7 for all companies that plan exploration: "The government... invites sealed bids for petroleum exploration licensing round for 23 blocks in the north western, western and eastern provinces of Zambia". More detail via Reuters. A new report issued by Human Rights Watch (HRW) calls on the Angolan government to end the arrest and torture of suspected rebels in the oil-rich enclave of Cabinda. The report, "‘They Put Me in the Hole’: Military Detention, Torture, and Lack of Due Process in Cabinda," details the increasing wave of violence against people in Cabinda by the Angolan armed forces and state intelligence officials. The President's Speech was the calmer part of yesterday's press conference, then the temperature went up with this Question & Answer Session. I am of the opinion that the Q&A was lacking in substance and more deeply disappointing compared to the main speech. The President clearly has not heeded the advice I gave in A Memo to Banda and Governing in difficult times. Needless to say the nature of the Q&A session was always going to have deep reactions from those singled for special treatment by the President. We'll keep a rolling update to the Q&A reactions. The Post was among the earliest to respond with their detailed editorial Rupiah is a Joker. The Media Ethics Council of Zambia (MECOZ) has come out in support the President Rupiah over the alleged controversy surrounding photos of a woman giving birth. The UPND Leader Hakainde Hichilema has launched a scathing attack on President Banda in the wake of the latter's remarks - Rupiah can't reconcile himself mentally, charges HH. The Pf Leader Michael Sata has now responded to the President's remarks - Rupiah has always been a total failure - Sata. Among the revelations from yesterday's press conference is the sad indication from President Banda that yet again the Government is again planning to reduce the mining taxes. More detail via Reuters. The full transcript of President Rupiah Banda's Press Conference today, as published on the State House website. The Government announced yesterday that it is seeking $800m for new power projects and plans to borrow up to half of that amount in 2009 to help ease disruptions of electricity supply. Finance Minister Situmbeko Musokotwane has indicated to the IMF that ZESCO and Government would like borrow up to $400 million externally to finance new power projects : "Given the importance of raising power supply to achieve... growth objectives, as well as limited availability of grants and concessional loans, the government and Zesco may need to contract new external non-concessional borrowing. Any non-concessional borrowing for these projects would not exceed $400 million in 2009". We have discussed debt and energy on this blog many times. Zambia's current external debt position is hovering around $2.3bn (see the 2008 Economic Report) and many continue voice concern e.g. here and here. For the avoidance of doubt, the problem remains lack of a coherent framework for securing debt that has the support of all Zambians. In this instance, its even more problematic because ZESCO has its own madness. We are borrowing to fund a company that has failed the Zambian people constantly. We have been working on a model for restructuring ZESCO (and ZAMTEL), which deserves much attention. Whether you go with our model or some other way, piling more debt on the backs of our unborn children off the back of an inefficient company is naive, at worst organised insanity. And the story behind this image (taken by The Post) can be found here and here. An interesting free classifieds Zambian ad site launched in last year : Buy in Zambia. Paying the price for unreliable power.. The decision of a firm to maintain its own-generation capability is driven by a variety of factors. In firm surveys, firms in countries reporting more than 60 days of power outages per year tend to identify power as a major constraint to doing business, and present relatively high rates of generator ownership. However, more rigorous empirical analysis shows that unreliable public power supplies is far from being the only or the largest factor driving generator ownership. Firm characteristics such as size, age, industrial sector and export orientation all have a major influence. In particular, the probability owning a generator doubles in large firms relative to small ones. Moreover, the behavioral model predicts that the percentage of firms owning their own generators would remain high (at around 20 percent) even if power supplies were perfectly reliable, suggesting that other factors such as emergency driven back-up requirements or export driven quality regulations play a critical role in the decision to own a generator. The costs of own generation are high, driven mainly by the variable cost of diesel fuel. In most cases they fall in the range US$0.30-0.70 per kilowatt-hour, which is often three times as high as the price of purchasing electricity from the public grid; although the latter is typically subsidized. Nevertheless, in most cases, this does not hugely affect the overall weighted average cost of power to firms given that own generation is only used during a relatively small percentage of the working year. At the same time, the survey evidence shows that the benefits of generator ownership are also substantial. Considering only lost sales resulting from periods of power outages, firms with their own generators report a value of lost load of typically less than US$50 per hour, which is only a fraction of the value of lost load in excess of US$150 per hour that is reported by firms in the same country that do not have their own generators. Nevertheless, when costs and benefits are considered side by side, the balance is not found to be significantly positive; a pattern which holds across countries, industrial sectors, and business scales. This may simply be because the analysis is only able to capture one dimension of the benefits of generator ownership – namely reduction in lost sales – but fails to capture many other important aspects – such as reduced damage to equipment, higher quality of production, and meeting reliability criterion for access to export markets. A number of policy implications emerge from these findings. First, while the overall scale of own generation in Africa is not that substantial overall, it plays a very important in a number of countries in the region, including some of the larger countries. This suggests that there may be some strategic value for these countries to think about the role that this significant additional generating capacity could play in national power supply. In many countries, own-generators are not allowed to sell power into the grid, even though this could make a valuable contribution to improving the availability of power in the country as a whole. Second, while improvements in the reliability of public power supplies would reduce the extent to which own generators were used and hence the level of variable costs incurred, it would in many cases not alter the firm’s basic decision to maintain its own back-up generation facilities. The reason is that there are other important motivations for holding these assets, including meeting international quality standards for participation in export markets, and dealing with critical sensitivities in the production process (for example, maintaining ventilation of mines). Third, through own generation the majority of large formal sector enterprises are able to effectively insulate themselves from the impact of unreliable power supplies. Although the cost of running such generators is high (typically US$0.25–0.45 per kilowatt-hour), given that outages are only intermittent, the overall impact on the weighted average cost of power supply to these firms is relatively small: of the order of a few cents per kilowatt-hour. The major victims of unreliable power supply are in the informal sector, where the limited survey evidence available suggests that generator ownership is an order of magnitude less prevalent than in the formal sector. The other major casualties are the formal sector firms that simply never open-up in countries where power supply is a constraining factor. The "recent comments" feed in the side-bar is currently not working. So Zedian was not the last person to comment! Blogger are working to fix the problem. This problem does not affect those tracking individual posts through email comments subscriptions. You'll still get alerts when someone comments on the relevant post you are tracking. The "recent comments" feed appears to be back to normal! There was a quite an outcry among the blogger community, which forced Google to get its act together. "Some wards are completely deserted while in other wards there is a skeleton staff. We are trying to impress upon the workers to return to work as we continue to dialogue with the government...I have been to 15 wards and I have seen 10 (uncollected) dead bodies. This is a crisis and I urge President Banda to visit the UTH and get first hand information about what is going on and to act quickly to save the situation". Zambia Congress of Trade Union (ZCTU) General Secretary Roy Mwaba speaking to Reuters on a national strike of nurses that has now entered its 17th day. Operations at University Teaching Hospital (UTH), one of the largest referral hospitals in Southern Africa and several hospitals across our nation have been paralysed. Nurses and paramedics last week rejected a 15% pay rise from Government, holding out for 25% increase. The ZCTU have declared the current situation in hospitals a "national disaster". The Government's response is that the strike is illegal and nurses need to return to work. We have previously discussed the on-going strikes here - Tackling Work Stoppages (Guest Blog). A Commissioner from the Police Public Complaints Authority has been arrested by the Drug Enforcement Commission (DEC) for money laundering involving K270 million. The money belonged to the Child Care and Adoption Society of Zambia where the alleged lead plunderer Pastor Chela is a President. More detail via this permanent link on Lusaka Times. How does someone seriously defraud an organisation like this? We now have Pastors alleged to have plundered the most vulnerable of the flock. For discussion on this form of corruption see - Corruption Wars ( Corruption & The Poor). Tovin Ngombe discusses why despite being among the first African countries to be hooked to the internet, Zambia has failed to improve the production of local content. The Zambia Institute of Advanced Legal Education (ZIALE) have established some web presence. The founder of Northrise University shares his vision for the university. Another Macauhub report that Mozambique may be linked to Angola by railroad via Zambia. The rail link apparently depends on the conclusion, over a distance of 2 kilometers of the railways line between Malawi and Zambia. According to Mozambican Ministry sources, "the link with several countries, particularly those with no sea border, will make the port of Nacala viable, in that there would be more opportunities for use of the port of Nacala by economic agents from those countries". We have previously discussed the major investments planned at Nicala here. An important project muted last month which we didn't pick up on is the planned Zambezi Waterway. Malawi, Zambia and Mozambique are planning to navigate the mighty Zambezi river's waterways by 2009 as an alternative and cheap transport route for imports and exports from and to the three southern African countries. Malawi is appears to be at the forefront of this project. More detail via IPS. IMF country policy documents release : First and Second Reviews of the Three-Year Arrangement Under the Poverty Reduction and Growth Facility, Request for Waivers of Nonobservance of Performance Criteria, and Augmentation of Access—Staff Report; Press Release on the Executive Board Discussion; and Statement by the Executive Director of Zambia. A wonderful library project in Lusaka - Lubuto Library Project. No Visas or No Visa Fees? A bit of organised confusion in the Post today on the issue of government's future visa policy. The headline read, "Govt intends to abolish visa fees – Mulongoti". A closer examination of the actual quote from Minister Mulongoti read, "at [the] political level there are plans to abolish visas, if that is done the immigration [department] is going to be irrelevant, you need to help raise the Gross Domestic Product (GDP) of the nation". Logic demands the latter is the more accurate description because having a visa regime that does not recover costs would be costly. This would also be consistent with the approach towards a SADC Schengen. When and where did President Mwanawasa die? "After Mwanawasa suffered his first stroke in April 2006, Miti played a key role in evacuating him to his doctors in the United Kingdom. A month later Miti in his capacity as Mwanawasa’s Physician, held a Press conference with a team of doctors to declare President Mwanawasa, fit to hold office and participate in the coming elections of 2006..... The decision to urge Mwanawasa, to continue his work as president, was fatal as he was already plagued by other serious diseases such as hypertension, epilepsy and diabetes. 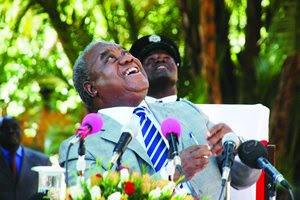 Political pressure prevailed and Mwanawasa stood for his second term. He died 2 years on 29th June 2008, when while on duty at the African Union (AU) meeting in Sharm El Sheik, Egypt, he suffered a fatal stroke". A quote we would quickly dismiss if it wasn't for the fact that it is comes from the latest in a series of documents that many now believe originate from inside the new Government spin machine. Official history, as told to the Zambian people, records that President Mwanawasa died in Paris on 19th August 2008. The Government last week signalled its intention to give large tracts of land to new investors from the UAE who wants to investment in sugar farming. According to Agriculture Minister Brian Chituwo, Zambia has so much land available there would not be opposition : "they are looking at 200,000 hectares, but we have 900,000 hectares of prime land available so the issue of land really should not be a problem. It is just a question of the mechanics of implementing this...". I look forward to learning more about these "mechanics" because last time I checked a village mother narrated that she has been waiting for two years to get a title deed. Sometime last month a Minister was arguing that chiefs should give up some of their land to facilitate investment because there was not enough land under government control. Which begs the question, is this 900,000 hectares owned by GRZ or part of the 96% land under customary ownership? More detail on this story via Reuters. 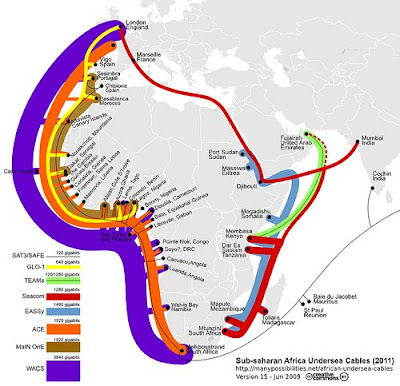 A wonderful visual map that brings to life the undersea internet cables around Africa - more detail including firms and data for each cable via Many Possibilities. The case for freedom of information ? There can be no doubt that Zambia would have been better off had it institutionalised transparency and accountability in its government structures. In an earlier article, I focused on how British parliamentarians became implicated in an expenses scandal that has seen the resignation of the powerful House of Commons Speaker Michael Martin, along with several members of Gordon Brown’s Cabinet. All this became possible through the publication by the UK’s Daily Telegraph of damning evidence of how British parliamentarians – across the political divide – helped themselves to the public purse through outrageously corrupt expenses claims. As a result, Brown’s Labour Party has suffered a devastating loss of councils in the just-ended local election. As if this was not enough, the Labour Party has also been dealt a humiliating and painful blow in the European Parliamentary elections, losing most of their seats to the Conservatives. Against people’s disenchantment with the Establishment politics, a disturbing phenomenon has emerged in British politics. What is described as a fascist and racist British National Party (BNP) seems close to gaining a foothold in mainstream British politics, signalling a dark chapter in that country. This is what happens when societies become so democratically bankrupt that people feel their voices are not heard. This is the tragedy of liberal democracies which elevate a more formalistic or mechanistic democracy, with little or no real civic participation. People become disillusioned and soon turn to something else – something more sinister. It is a way of striking out at the elite system of democracy. We must remember that Britain dithered about the enactment and implementation of its Freedom of Information Act of 2000. And now they are paying the price for it. What has happened at the Ministry of Health in our country, and possibly what is true of all other government ministries and departments, is bad for democratic politics. This is what happens when government operations are shrouded in secrecy, known only to a select few. It is so heart-rending to read that the permanent secretary in the Ministry of Health may not have been privy to some of the financial decisions made on behalf of the ministry. This is why there is urgent need to open up the government system to greater public scrutiny. We have had enough talk about national security. In the past, I have used up enough space of my column to debunk the notion that national security is the raison d'être for keeping a closed government bureaucracy. Our politicians’ understanding of national security is narrow, circumscribed around their party-political survival. Properly understood, national security includes protecting the country against grand corruption, which can result in any number of social upheavals. We have already begun to witness such upheavals the country. It would be foolhardy not to correlate the on-going health workers’ strike to the cases of plunder of financial resources in the Ministry of Health. The workers have realised – painfully – that if people can steal as much as K27 billion from a single ministry, the government must be awash in money. If the crippling of the health system cannot be described as a threat to national security, then I don’t know what can. Many government workers are convinced that the Zambian government, if it managed its financial resources prudently, would be able to pay them a decent wage. The government could help itself with more ease than imaginable. It can help the public track its financial performance. Such opening up can play a corruption-preventive role. Indeed, workers can, for themselves, follow the trail of money and understand why their salaries are structured the way they are. The first thing, then, is to speed up the enactment of the Freedom of Information (FOI) Act. This is not just for media workers, incidentally. It is for any Zambia citizen who has a legitimate reason to ask for information relating to any aspect of government performance. It is easy to see how such a law will make it difficult for people to hide behind the veil of secrecy that so characterises the government structure. It would compel civil servants to discharge their services with a degree of probity. It would encourage ordinary Zambians to “own’ their government and thus become co-responsible for its operations. The second thing is for government ministries and departments to become proactively transparent in their deeds. They need not wait for, nor indeed dread, the Auditor-General’s annual reports. In the age of Internetisation, government bodies can publish online, monthly or quarterly perhaps, details of their financial incomes and expenditures for people to see. Zambia must run an open government. Here, we can perhaps learn from President Barack Obama. On his first full day in office, President Obama issued an Executive Order and several memoranda on transparency. His “open government agenda” has six key features, five of which are relevant to the Zambian situation. Second, it limits the scope of claims of executive privilege, ensuring that citizens have greater access to presidential records and communications, with fewer and narrower cases of executive privilege. Third, it emphasises affirmative disclosure of information, whereby the public’s right to be informed about decisions and facts that affect it should encompass a duty on the part of the government to proactively disclose and disseminate information that is relevant to affected communities. Fourth, it emphasises public participation, guaranteeing that decisions best reflect the interest of the public and benefit from the greatest level of possible expertise. In other words, it ensures that government is participatory. Fifth, it uses new technologies innovatively to promote interactivity between public servants and the citizenry in decision-making, in the belief that such an interactive platform will enable the public to track, review and comment on decisions made by the head of the executive. Our Zambian government system demonstrates a lackadaisical approach to such noble principles of transparency and accountability. While we cannot reproduce Obama’s open government agenda in its exactness, there are some important steps that we can take, not least speeding up the enactment of Freedom of Information (FOI) legislation. We can also configure our government web sites in such a way that there is genuine interactivity. Our State House web site, for example, has been “under construction” longer than I can remember. When it is up and running, I hope that it will answer to the communicative imperatives of simplicity of navigation, interactivity, and the like. I also hope that its content will be much more than the mundane. The same lessons can be extended to all other government web sites. Many of them tend to be for show rather than serious engagement with the public. Why, for example, can’t citizens, download certain application forms from such web sites? Indeed, it is not clear whether or not they are updated. Nor is it clear that their feedback facility is fully exploited. E-Government can help build openness and restore public confidence in the government bureaucracy. Of course, I realise that the majority of Zambians have little or no access to the Internet, but we can always hope for a ‘remediation’ of such online content through other more accessible channels, such as radio, newspapers, television, and the like. The bottom-line, however, is that Zambia needs an open government to enhance its national security. In some instances, national security is not about secrecy; it is about transparency. There's a lot I agree with in the article, especially the need for a general "opening up" of government, underpinned by clear principles on good governance. The call for greater e-government is particularly sounded. Indeed I touch on this issue in Governing in difficult times. But there's one area where Fackson's does not provide a balanced assessment : Freedom of Information. There are huge costs associated with Freedom of Information which he has overlooked e.g. resource costs (some has to handle your query), IT equipment (need I say more?) and biggest of them all the need for an Information Regulator. A whole new office dedicated to ensure your requests are being taken serious. Incidentally, as with every new legislation, where parties disagree the matter ends up in court (more cases for the Judiciary to handle on top the corruption cases). It might be that on the balance the social benefits of freedom of information outweigh the costs, but we should not overlook the costs involved as we debate these issues. A balanced assessment is needed informed by real numbers. A new World Bank Policy Research Working Paper offers new evidence on the impact of infrastructure development on economic growth in African countries. This is a much studied area, but it attempts to advance the literature by assessing the impact of several types of infrastructure instead of the overall infrastructure, as well as including measures of service quality. (a) Growth is positively affected by the volume of infrastructure stocks and the quality of infrastructure services. Their impact is robust and statistically significant to changes in the aggregate index of infrastructure used. Our empirical estimates address the issue of reverse causality and survive a battery of statistical tests.... From this we conclude that the above results reflect causal, and not merely coincidental, effects of infrastructure on productivity growth. (b) Our simulations show that our empirical findings are significant not only statistically but also economically. For instance, if all African countries were to catch up with the region’s leader, Mauritius, in terms of infrastructure stock and quality, their rate of economic growth would be enhanced—on average by 2.2 percent per year, and ranging from 0.6 to 3.5 percent (South Africa and Niger, respectively). Catching up with the East Asian "miracle" economies (EAP7) median would involve even larger gains (2.6 percent per year), though with a larger variation—that is, ranging from 0.4 to 3.9 percent per year (Mauritius and Niger, respectively). But we should point out that these catch-up scenarios implicitly assume potentially large investment efforts in the transition toward increased levels of infrastructure development. Finally, when identifying areas of opportunity to trigger productivity growth we find that African countries have a higher probability of getting larger benefits from infrastructure development through larger stocks of infrastructure. The African infrastructure gap, especially with the representative countries in Western Europe and the EAP7, is still very large. But the payoffs are heterogeneous across subregions—with North Africa showing a narrower infrastructure gap and Central Africa showing the largest gap.